Air Dry - On a painting trip, we hung our clothes on the line to dry in Truro. I couldn't resist the urge to capture this image. 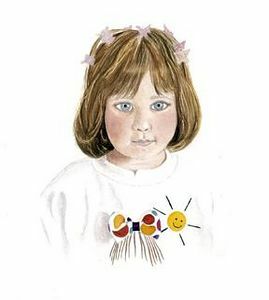 Becky - what a delight to capture this little girl's unique personality in a portrait. 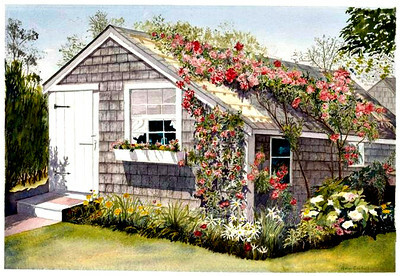 A Summer Place - everyone's idea of a perfect place to relax on vacation. 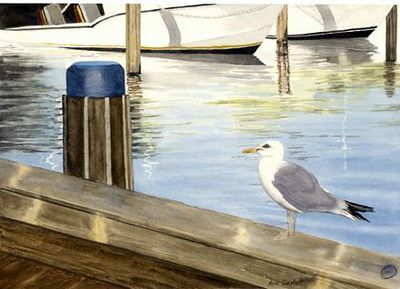 Bird's Eye View - Nantucket Harbor through the eyes of a sea gul. Air Dry - On a paiting trip to Truro, we all hung our clothes on the line to dry. Dexter Grist Mill - A landmark in the village of Sandwich. 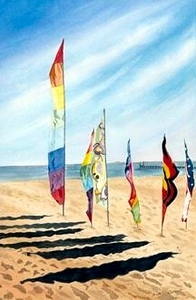 Flags in The Sand - This painting was inspired by a scene in Provincetown, on Cape Cod. 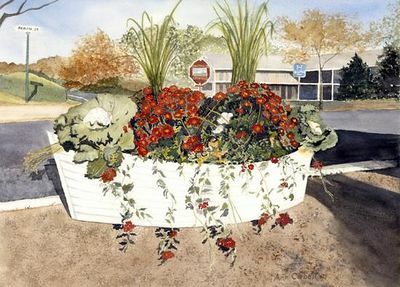 Flower Truck - Every day in season, this truck comes to the village of 'Sconset to sell flowers. 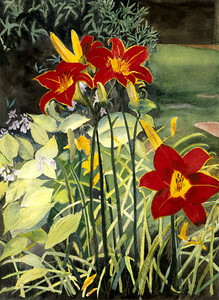 Helen's Garden - These beatiful lilies in my sister's garden were a joy to paint. 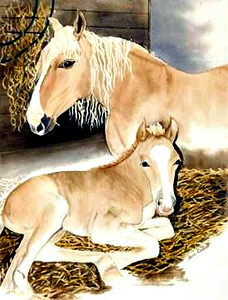 Haflinger Horses- These beautiful horses are bred at Dunlough Castle in Ireland. 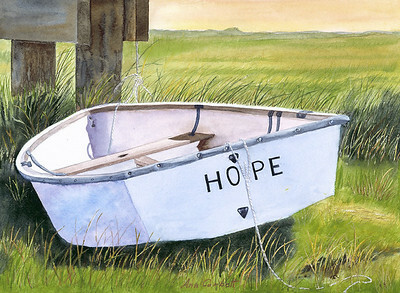 9/11 Hyannisport - When I went to Hyannisport Golf Club the day after 9/11, this tribute seemed to offer hope for a brighter future. 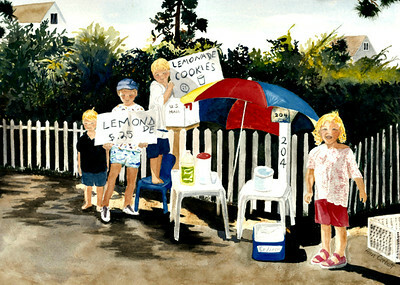 Lemonade Stand - I met these children on my walk and asked them to pose for me. As you can see, they were delighted! 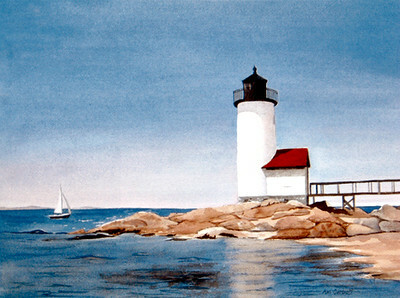 Annisquam Lighthouse - The perfect lighthouse to paint! Mail Call - While driving by these mailboxes in Hyannis, I had to stop to capture the shadows. 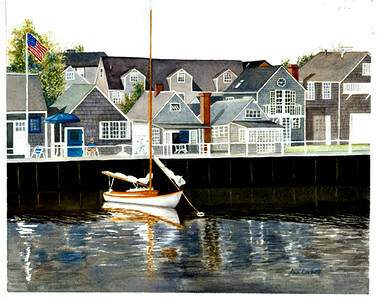 Boats in Nantucket Harbor - The reflections of the boats and the houses were fun to paint. 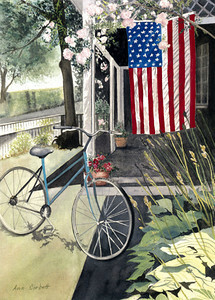 Nantucket Shopping - What could be nicer than riding your bicycle to shop at the little stores on Nantucket Harbor? Nobska Light - A very familiar landmark at Wood's Hole in Falmouth. 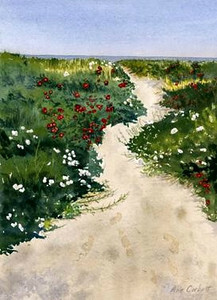 Nubble Light- I wanted to paint a different view across the rocks of this familiar landmark in Maine. 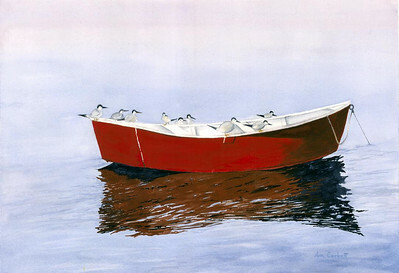 One Red Boat - This boat in Barnstable harbor has been painted many times. 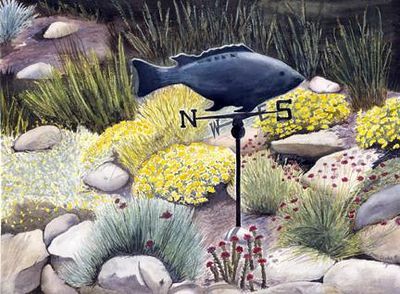 The reflections in the water balance the image. Truro Cottages - We stayed in these cottages on a painting trip to Truro. 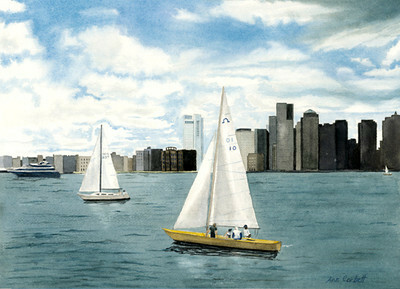 We were there when we heard about 9/11. 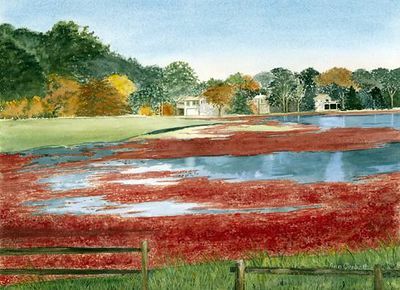 Pamet Harbor - This painting is on the cover of a mystery novel called Murder on the Dunes. Adirondack View A peaceful view from one of the cottages in Truro. 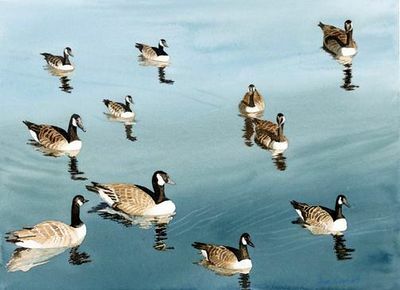 Reflections- The reflections of these Canada geese in the water in Hyannis Harbor were perfect! 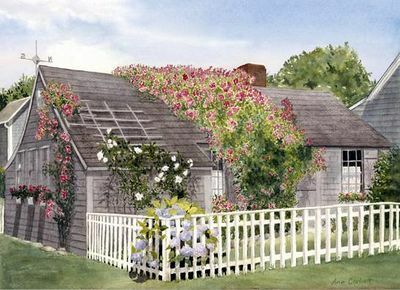 'Sconset Cottage II - I have painted this cottage many times because of it's charm. 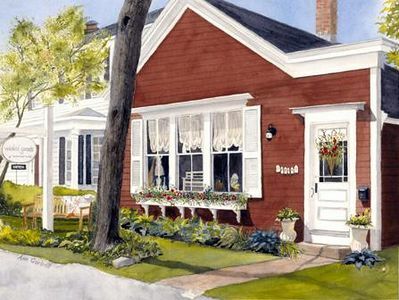 A perfect vacation spot! 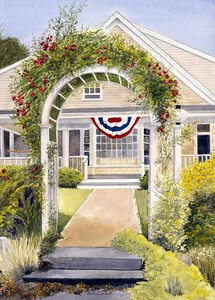 This charming home in Hyannisport shows it's patriotic colors. Summer Sale - The items on display outside this store seem to draw you inside to look around. These Boots Were Made for Flowers - A welcome sight at a Secret Garden Tour. 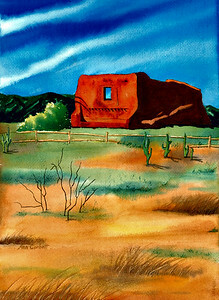 I painted this watercolor for an auction to benefit The American Heart Association. The name of the boat seemed appropriate.